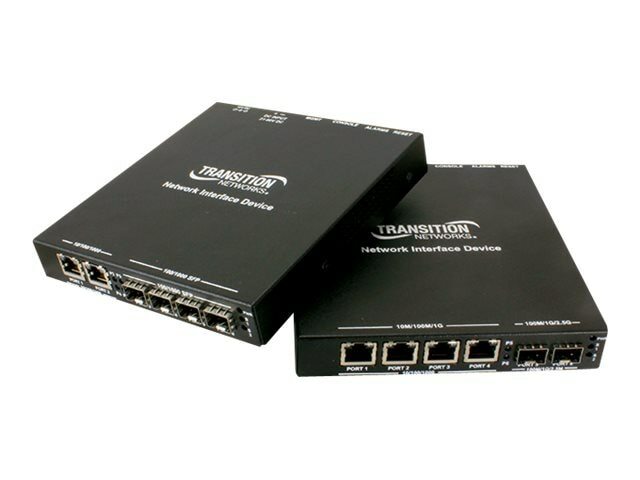 Transition Networks' managed S3290 NID provides advanced packet performance metering and service creation directly at customer premises and cell sites. The S3290 is optimized for business Ethernet and mobile backhaul deployments. The S3290 is a multi-service NID that provides SLA-assurance and advanced fault management that is MEF CE2.0 certified. IEEE 802.1ag Service OAM, ITU Y.1731 performance monitoring and IEEE 802.3ah Link OAM are standard features. The S3290 supports advance features such as IPv6 and IPv4, VLANs, QoS, bandwidth allocation, ring protection, jumbo frames and numerous security features. The S3290 can be managed and provisioned with Transition Networks Converge EMS or via Web, CLI and SNMP (v1, v2c & v3). The product supports SSL/SSH, RADIUS, TACACS+, management VLAN and ACL rules. The S3290 offers AC or DC power inputs for operation in a variety of environments. The SFP ports are triple speed and support 100Mbps, 1000Mbps or SGMII SFPs. CWDM and Bi-Di SFPs are also supported, allowing for flexible network architectures.